The US offers considerably less parental leave than most other countries. For example, the US has a maximum of 12 weeks of job-protected job leave for mothers. In Italy, Denmark, Japan, and Great Britain, the maximum is more like year; in Spain, France, and Germany, the maximum is more than three years. In the United States, none of that time is guaranteed by federal law to be paid leave; in other countries, paid leave is often up to about a year (for example, in Italy, Canada, Sweden, Germany). Should the US move toward additional parental leave? For those interested in a diversity of views on this subject, the American Enterprise Institute and the Brookings Institution recently started a joint blog the subject of "Paid Family Leave," which within the couple of months includes short contributions from Abby McCloskey, Eleanor Krause and Richard Reeves, Christopher Ruhm, Harry Holzer, Aparna Mathur, Isabel Sawhill, James Pethoukoukis, and others. Olivetti and Petrongolo point out that it can be difficult to craft a fully persuasive study about the effects of laws relating to parental leave. For example, such laws may be passed at a time when society has more broadly become more supportive in many ways of mothers with younger children returning to the (paid) workforce. In this case, the parental leave law might be just one manifestation of many other social changes, and so separating out the specific effect of the law from the underlying social patterns is tricky. rights. Comparable maternal leave rights are currently coexisting with relatively gender-biased norms in Italy—where, according to the European Values Survey, 70 percent of the population agree or strongly agree with the statement “Pre-school children suffer from a working mother,” but with much more gender-neutral attitudes in Denmark—where only 10 percent of the population agree with that statement. In fact, cross-country evidence does not reveal any clear-cut association between the generosity of parental leave and answers to gender-related survey questions. ... However, countries with more conservative views on men and women’s roles in society tend to spend less on early childhood education and child care, and are less likely to accommodate flexible working arrangements." 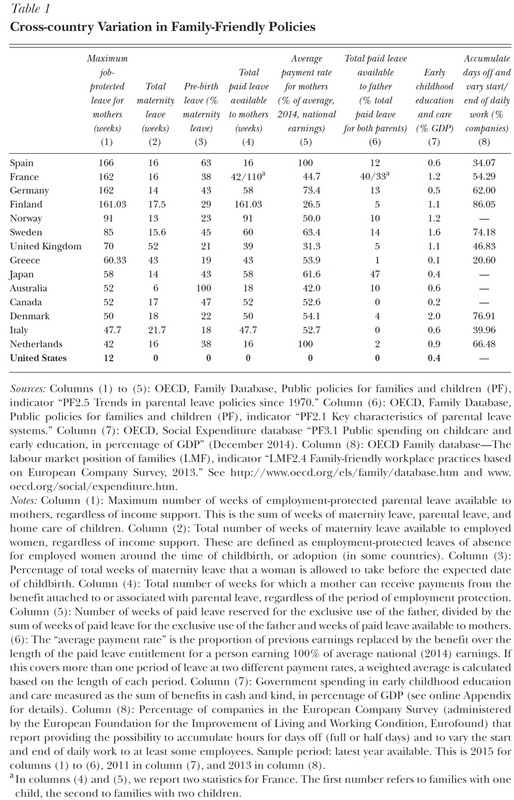 "While both the macro and micro literatures tend to find overall positive effects of subsidized child care on female employment, the discussion above illustrates that no obvious consensus emerges from the literature that has studied the labor market impact of parental leave rights and benefits. Cross-country studies, with weaker identification, point to a positive correlation with maternal employment rates, albeit this effect is limited to short or intermediate leave durations, and mostly applies to less-skilled women, with virtually no impact for the more educated. Extremely long leave durations seem instead to have inhibitive effects. On the other hand, studies on microdata tend to find that parental leave mostly delays return to work, with no discernible effects on employment rates in the long run. ..."
"In a nutshell, there is little compelling evidence that extended parental leave rights have an overall positive effect on female outcomes. 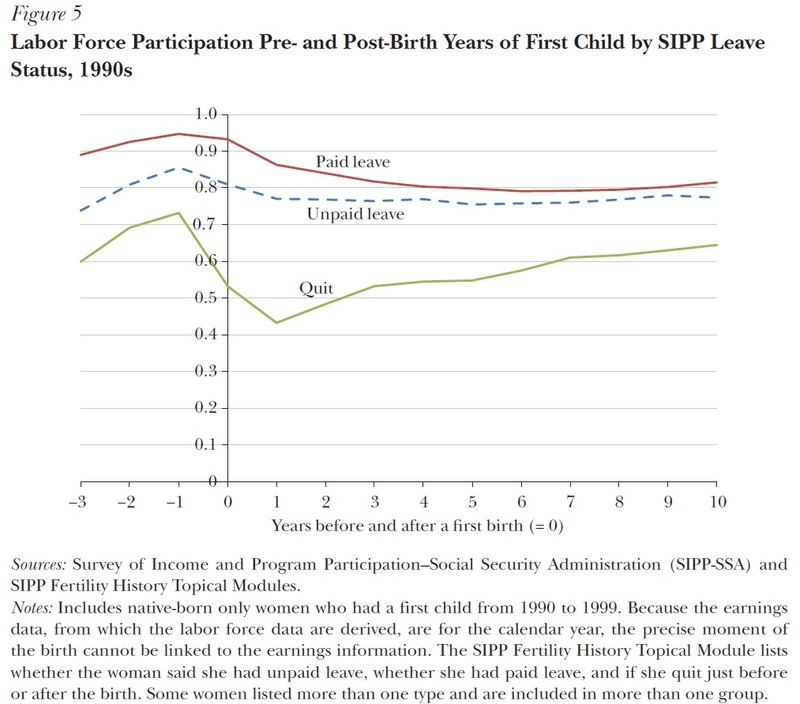 The policies with the strongest evidence for reducing gender disparities seem to be early childhood spending (in both cross-country and microdata) and in-work benefits (in the microdata). A potential common theme here is that making it easier to be a working mother may matter more than the length of leave or the payments." 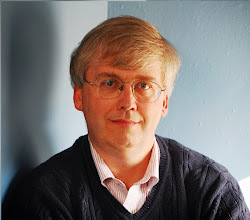 "The experience of Scandinavian countries produces an interesting perspective. While the expansion of family policies may have increased female labor force participation, much of the increase was in part-time work, and women in these countries were less likely to be in management and professional occupations than women in the United States. Indeed, the gender gap in Sweden is larger at the upper end of the earnings distribution, consistent with the notion of underlying factors leading to a “glass ceiling” that limits women from advancing . Two recent studies using administrative data on earnings from Sweden and Denmark provide convincing evidence that mothers, but not fathers, have large reductions in relative earnings following the birth of their first child in both countries. ... The persistence of children-related wage gaps in these countries with very generous family policies casts doubt on the notion that these policies constitute a panacea that will reduce the gender gap. It is plausible that adopting family policies and other programs that support working families as they go about the business of bringing up children—an expensive proposition—may improve family and children’s well-being. But it is not clear that such policies narrow the gender gap in earnings." In a different essay, Claudia Goldin and Joshua Mitchell write about "The New Life Cycle of Women’s Employment: Disappearing Humps, Sagging Middles, Expanding Tops." Again, there is some discussion of parental leave near the end of the paper. 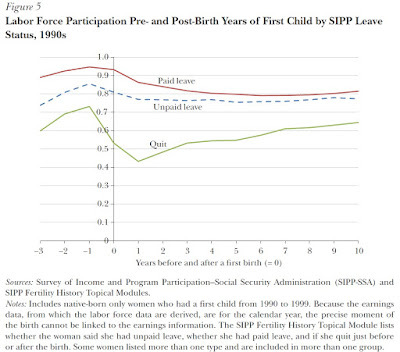 I was struck by this figure showing the labor force participation rates of US women before and after a birth, depending on whether they took paid leave, unpaid leave, or quit their job. My interpretation of this figure is that jobs which offer paid leave to mothers are often more attractive and better paid than jobs that offer only unpaid leave. Thus, those mothers who take paid leave are more likely to be in the workforce in the first place and more likely to re-enter the workforce. But notice that the gap between paid and unpaid leave is not very large, while the gap between unpaid leave and quits is much larger. My interpretation would be that distinction between whether a mother has a job to which she wishes to return--and thus whether she takes unpaid leave or quits--is more important than the gap between paid and unpaid leave. For those who want a bit more factual background, here is a figure and a table from Olivetti and Petrongolo. 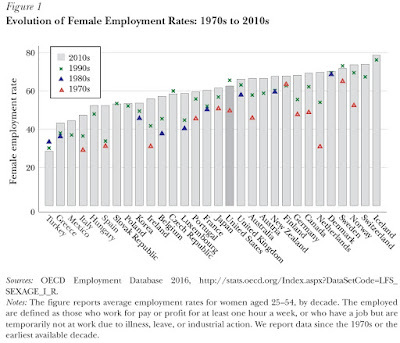 The figure shows cross-country comparisons in employment rates of women over time. The bars show data for 2010s, but the green x's, blue triangles, and orange triangles show data for the 1970s, 1980s, and 1990s. They write: "In most countries, female employment has increased in recent decades, from 49 percent on average in the 1980s to 60 percent in the 2010s. However, there is no evidence of narrowing differences in female employment across countries. 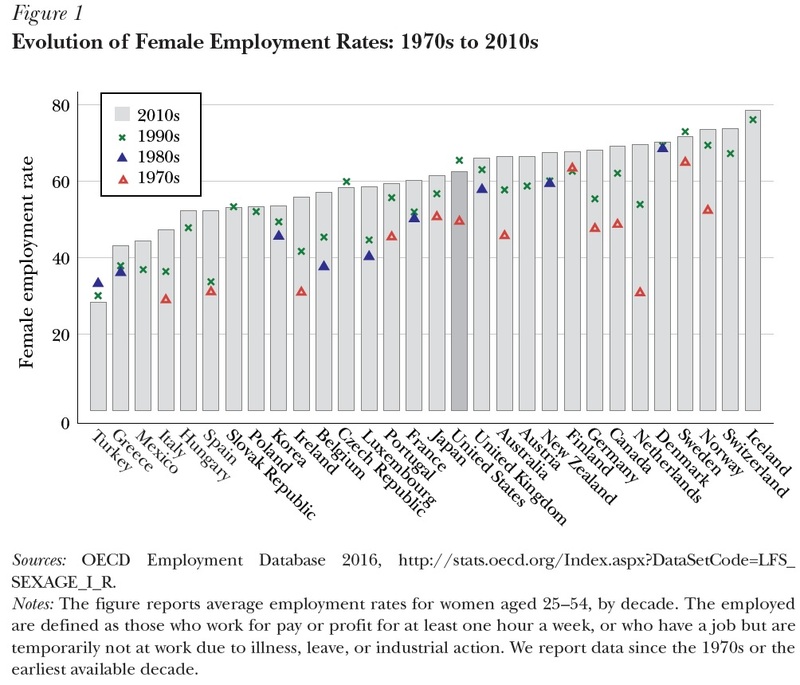 Until the 1990s, the female employment rate in the United States was among the highest in this sample of countries, but it actually declined since then, from about 66 percent in the 1990s to about 62 percent in the 2010s, and now ranks very close to the sample median."